So there's a timeout for reply's??? OK, here it is, again. If You're somehow related to GoPro, isn't that easy to try, what happens when charging/recording simultaneously (with some other cable)? "Also, try testing the camera while being connected to a different power source"
It will drain the battery with three different car chargers, one QC3, power taken either C or USB A plug, both up to 12V, one is Huawei's 5/9V 2A, and one is "regular". And with portable power source. USB A->C, (many of them), and C->C. Should be easy find, for testing. I still really hope I've got two faulty units. Ok, did some bench testing today to get more details of the GoPro Hero 7 battery depletion in the record mode on external power. For this test I setup a GoPro Hero 6 Black and a GoPro Hero 7 Black. Hardware supporting each camera was identical: cable, power supply. I set each camera with identical settings: 4k @ 60 FPS with stabilization. I then ran each camera in the record mode for exactly 10 minutes multiple times. GoPro Hero 6 Black completed 10 minutes of recording with 100% battery remaining. GoPro Hero 7 Black completed 10 minutes of recording with 91% battery remaining. These results coincide with my usage running the Hero 7 Black for a hour or more continuously. On external power the GoPro Hero 7 battery depletes around 1% per minute of recording. The GoPro Hero 6 battery remains at full strength. Some additional information. With the same configuration the Hero 7 Black will run just fine without a battery in the camera. During the testing I had one run where the Hero 7 Black battery did not deplete remaining at 100% at the end of the test. This is the first time I have used the Hero 7 Black on external power and witnessed no battery depletion. This all suggests some firmware issue versus hardware to me. Bottom line the Hero 7 Black is really not fully debugged to be running on external power. Between this issue and the record mode crashes involving certain USB-C cable attachments and battery supplies it is very challenging to produce any video content on external power. Obviously this impacts the most significantly the most valued feature of this camera: stabilized 4k @ 60 fps recording as this mode will draw down the internal battery very fast. Time to stop blaming this on off spec cables and SD cards. All of this is most likely firmware bugs that were not properly worked out before sale. "Time to stop blaming this on off spec cables and SD cards. All of this is most likely firmware bugs that were not properly worked out before sale." If standard, quality cables/SD has such an effect, even for charging, then we can expect, nothing is according to a standards. When Hero 6 can keep battery alive, while recording, I doubt, whether it's hw issue. So GoPro, when do we get a FIX for this issue?? So, a new fw 1.6 arrived. A phone got an update ... after that I tried to update gopro with new firmware. An other device (tablet), fresh installation - no way. An other SD card, and manual update - done. Gopro original and a good one. With gopro original & C to C (rated for 60W) cables, both, battery still draining while recording. Power supply is Satechi, should be capable for more that 3A - and I can see those figurres in my tablet by charging monitor. I have had the same problem with my two Hero 7 Blacks. I'm using the GoPro cable that came with camera. Power supply is OUTXE 24000mAh Rugges Charger with dual input Type C & Micro USB. My hero 5 charges just fine with it. While the cameras are in Record mode.... there is no charge. When I'm not recording, I get the charge indication. The SD card is Samsung 128GB EVO (on the approved GoPro list). I know that a new firmware update came out, so I'll install that and test the external battery pack tomorrow. Applied 1.61 to both Hero 7 Blacks. Both camers went upsided down after update with crashes and freezes. Just did a full manual reinstall of 1.61 and they seem stable right now. I can confirm in my first test that the battery does not deplete during recording. It just stays the same which is ok with me. Through it all my Hero 6 Black just keeps working. Same cables and several different external power devices, same ones I use for the both Hero 7 Blacks. My application involves 1 or 2 hours continuous operation on external power. Will test 1.61 in those conditions. Was able to keep both cameras running on external power for over an hour on 1.51 a few days ago. Here is the raw cut of that video. Thank you for the update, @ilpol3114. 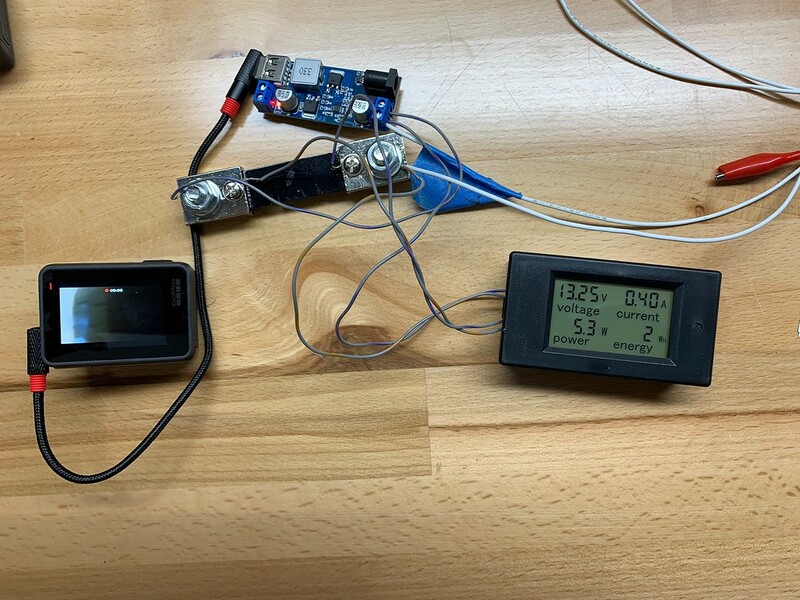 We have initiated tests to to determine battery status while camera is recording and connected to a power source. We are still collating results. @tj311 and @fireyoasis236, please let us know how it goes with the battery when you test with the new firmware. We will include the results as we pass this along to the team. Thanks! Updated both of my hero 7 blacks to latest firmware 1.61 manually. After the update, I did a factory reset to both. I ran one camera on external battery pack for about an hour and a half. (I ran it inside my house) I stopped a few times to check the battery drain. Twice, the battery indicator showed 65%, but when I pressed the record button and then the stop button, the indicator went up to 91% charge. So, I did this a few times throughout the recording process and each time, the battery would jump back up to 91% charge remaining. So, it looks like it's NOT draining the battery during recording. The indication is just flakey, maybe?? I'll check both cameras out in the field next week. (I kayak fish for several hours, and record the event). We'll see how it performs in the real world situation.